Washington (AFP) – Is home a burden, tied to endless chores and confinement, or a liberating shelter? Turns out it can be both for women artists exploring and deconstructing notions of domestic space and gender in a show opening Friday at the National Museum of Women in the Arts in Washington. Running across several generations and featuring 36 international artists working in various media, the result is full of humor — both the dark and the laugh-out-loud kind. A loaf sticks out of an open door to an oven she carries with a strap around her neck. It’s a heavy, awkward apron. The show could not be more topical in a #MeToo era punctuated by revelations of widespread sexual misconduct and abuse of women across multiple industries, and coincides with International Women’s Day. Traditional gender roles become a chess game in British artist Rachel Whiteread’s 2005 sculpture “Modern Chess Set,” where the husband’s seating areas and television face off against the wife’s trash cans and dusters. The husband’s “king” is the fridge. The woman’s? The stove. “The artists we chose, they are indeed interested in gender. But sometimes it’s poetic… everything is not brutally feminist,” said Camille Morineau, who curated the show with Lucia Pesapane, both from the Monnaie de Paris, the French national mint. In one especially jolting installation, London-based Palestinian Mona Hatoum transforms ordinary kitchen utensils into a menacing situation. A live current hums loudly and runs through the instruments laid out on a table behind horizontal metal wire, lighting up colanders and graters. 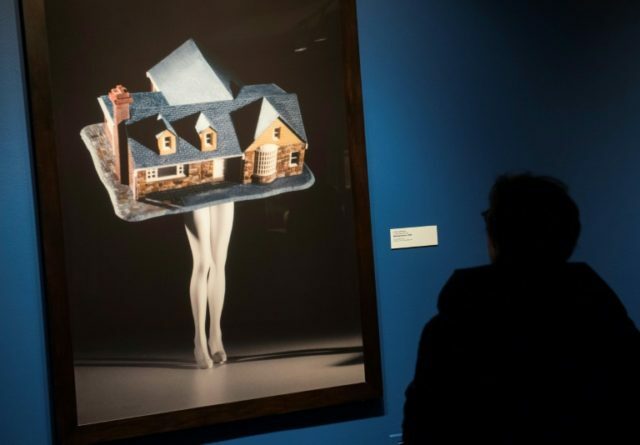 “Since I was a kid, I always had fantasies of anthropomorphizing objects around me,” said Laurie Simmons, whose “Walking House” (1989) shows a heavy tilting home carried by a svelte pair of legs. “That kind of collides with my idea that women have a way of morphing into where they live and what they have, and they identify themselves oftentimes through objects and a sense of place and a sense of home,” she told AFP. “Women House,” as the exhibition is titled, was inspired by a groundbreaking 1972 Los Angeles show organized by Judy Chicago and Miriam Schapiro that explored similar themes. Some of the works here poignantly reflect on the sometimes oppressive nature of women’s condition, and their struggle to make a break. In her 1998 video “Hammering Out (an old argument),” Italy’s Monica Bonvicini shows a woman’s arm using a hammer to repeatedly pound on a wall in a desperate effort to break it. The woman only manages to expose the underlying brick. The work is juxtaposed with one by Dutch artist Lydia Schouten, shown in a tight-fitting white dance outfit rubbing against the bars of a color-coated iron cage. There’s also some of Louise Bourgeois’s “Femme Maison,” where women literally become a house, or a house becomes a woman, as well as sketches for Niki de Saint Phalle’s various “Nana Maison” (Chick House). Morineau said it’s high time for women to get the place they deserve in the canon of art history. “We should be allowing new names, theories, movements and vocabulary to enter this space,” she said in an interview. The show runs through May 28.